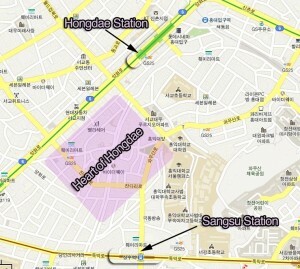 Did you know if you’re hanging out in Hongdae, Hongdae Station is not the only way you can get to the Hongdae area? Find out these Seoul subway shortcuts that can only come with local knowledge. 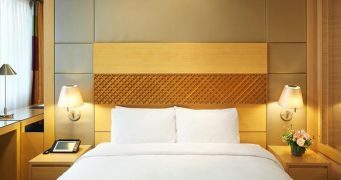 These tips will help you save some time by eliminating unnecessary transfers and also allowing you to travel to other places to hang out in Seoul easier. 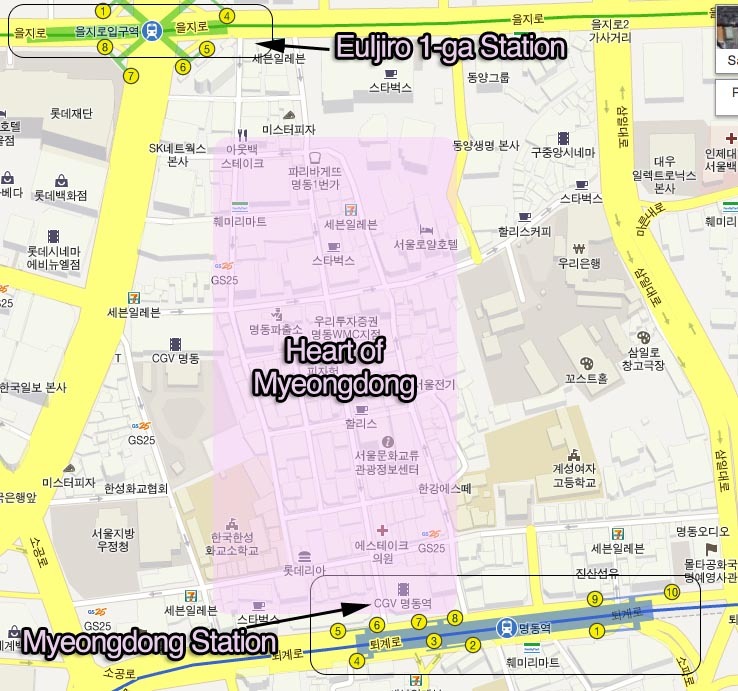 Myeongdong is a famous shopping district of Seoul and mega tourist hot spot. Sure, taking Seoul line number 4 to Myeongdong Station and getting out at exit 6 will get you to the heart of Myeongdong, but you can also take line number 2 and get off at Euljiro 1-ga Station. This can be better if you’re going to or coming from other popular places to hang out in Seoul (Hongdae, Gangnam, Shinchon, Coex, etc.). 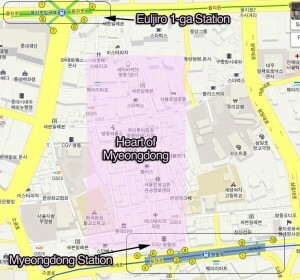 Leave exit 5 of Euljiro 1-ga Station and keep walking until you see the entrance to Myeongdong on your left. 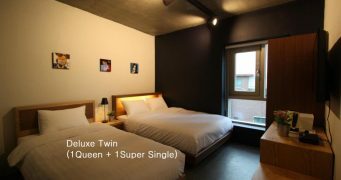 Hongdae is a poppin college town with tons of restaurants, bars, clubs, cafes, shopping streets, and anything else you can think of. Some people are totally logical and can figure out on their own that going to Hongdae Station (line 2, exit 9) will get you to the main Hongdae area. But only do savvy Korea travelers know that Sangsu Station (line 6, exit 1 or 2) will get you to the heart of Hongdae just as fast. 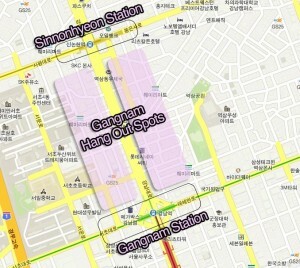 Sangsu Station is a good option if you’re headed to or coming from another Seoul hang out spot, Itaewon. Gangnam Station is huge and there are tons of places to hang out, but the majority of the hanging out is done out of Gangnam Station, line 2, exits 10 and 11. That’s where all the restaurants and bars are. But if you’re coming from Incheon or somewhere from north west Seoul, line number 9 (exits 5 & 6) might be the better option to getting to Gangnam. You might save a transfer, and you also might get there quicker as there’s also an express train. It’ll get you to the same general restaurant and bar area. Gyeongbokgung is a historical Seoul tourist attraction that tons of people find by taking line number 3 to Gyeongbokgung Station. It’ll get you straight to the gate; it is extremely straightforward. But if you want to kill two Seoul tourist attraction birds with one stone, you can also get off at Gwangwamun Station (line 5, exit 2). Although the station is a few minutes farther than Gyeongbokgung, there’s a few other Seoul tourist attractions, such as Cheonggyecheon and Gwanghwamun Square, you can see before or after your trip to Gyeongbokgung. 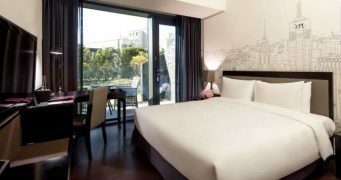 Insadong is a Seoul sightseeing attraction because of the traditional Korean cultural experience that can be found (i.e. 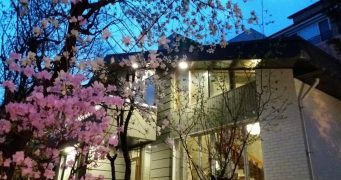 Korean crafts, antiques, art, tea houses, etc.). 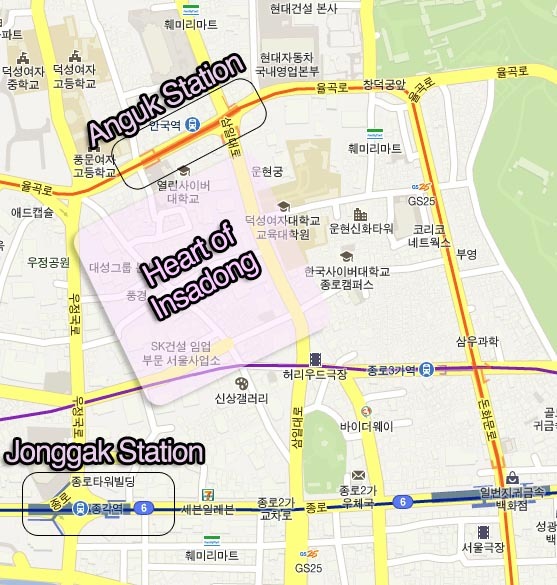 Most places on the internet will tell you that Insadong can be accessed via Anguk Station (line 3, exit 6). But what local Koreans know is that you can save a transfer if you’re already on line 5. You can get off at Jonggak Station for a short little walk over to Insadong. 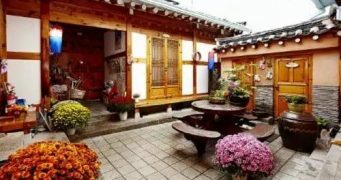 If you are taking this alternative route to Insadong, you can also check out Jonggak, a centuries year old bell that is set in the middle of Seoul’s modern office buildings. The largest underground mall in the world, COEX Mall, was just recently renovated. 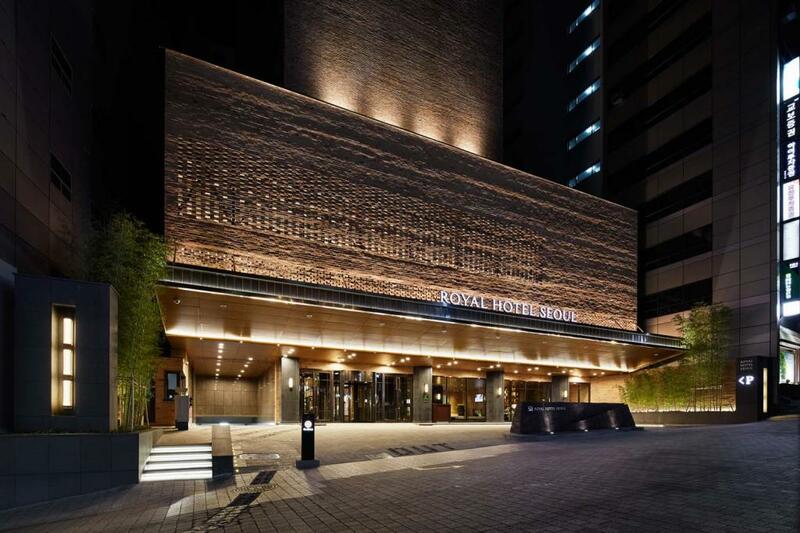 It now includes some of the most popular restaurants in Seoul along with popular domestic fashion brands. Along with the renovation also came a new subway station. Originally, the only subway access was through Samseong Station, (Line 2, Exit 5). 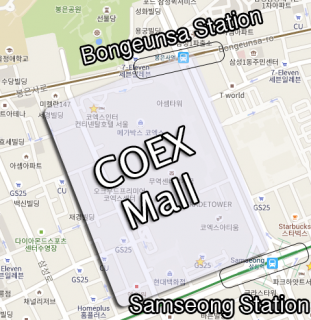 But if you get off of Exit 7 of Bongeunsa Station (line 9), you’ll now also be able to reach COEX as well. This is a great option if you’re coming from northwestern Seoul as the express train will get you there quickly. Also, you can stop by one of Seoul’s most beautiful temples Bongeungsa Temple (Exit 1) before heading to COEX. 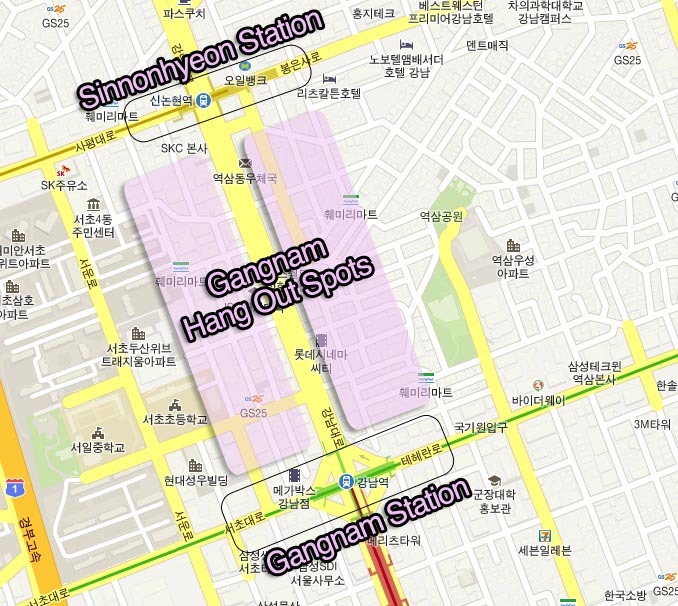 Have your own favorite Seoul subway shortcuts? Share with us in the comment section! I still want to go to Myeongdong soon and take a look around.. so i’ll use your tip and try it that way 🙂 thx! I was just in Myeongdong for some shopping on a Thursday night and it was packed with shoppers! 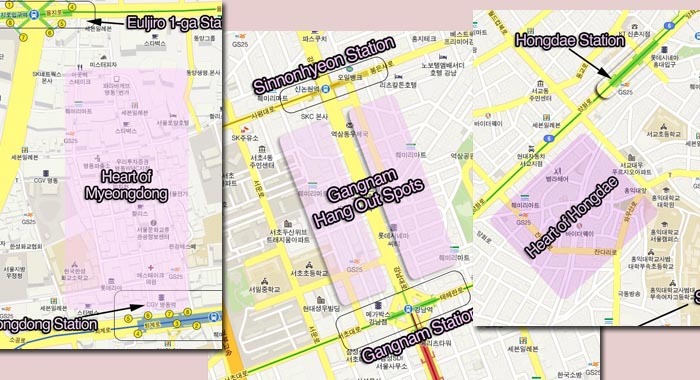 For getting around in Gangnam and Apgujeong, it helps to realize that Gangnam Station (line 2), Sinnonhyeon Station (line 9), Nonhyeon station (line 7), and Sinsa station (line 3) are all in a straight line on Gangnam Daero (the main street in Gangnam). It takes around 30 minutes if you want to walk from Sinsa station to Gangnam, but it’s only 2 stops by bus. If you’re on line 3 or line 7, it’s usually faster to get off at Sinsa or Nonhyeon station and take the bus than it is to transfer on the subway. Exit the station heading south, cross to the middle of the road, then take pretty much any bus to the Sinnonhyeon stop (which is actually in the heart of what most people think of as “Gangnam”, right in front of CGV). Sorry if that’s confusing… But it took me a while after moving here to figure out that certain stations on different lines were close enough to walk to. Google maps is your best friend. Should also mention that Jonggak is also on Line 1. Honestly, the best way for most people commuting from Line 4 to Insadong would be to transfer at Dongdaemun or Seoul Station to Line 1 and go that way to Jonggak. Plus Jonggak has a pretty baller underground shopping center, including (IMO) the best Bandi & Luni’s in Seoul as far as an English section is concerned. 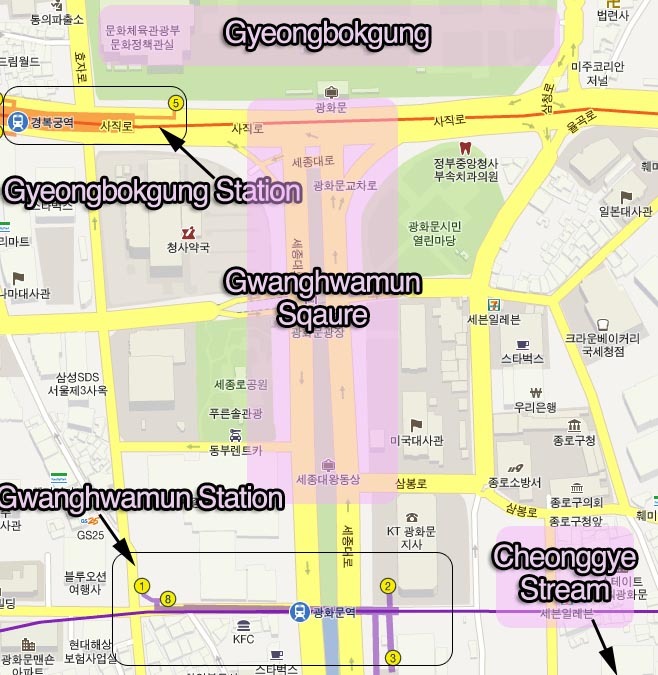 Also, to further talk about Jonggak, it’s not that far a jaunt from Jonggak to Gwanghwamun square, maybe 10-15 minutes tops. This is really a heavily tourist-centric area, lots of good stuff focused into a very small space, and really, Jonggak is a good station to go to if you just want to find something to do, but have no clue what to do, being sandwiched in between Gwanghwamun, Gyeongbokgung, and Insadong, and it has a LOTLOTLOTLOT of food choices. Another really helpful article, Keith. I spend more time getting lost in the subway trying to make up my own shortcuts than is probably healthy, so this is excellent! 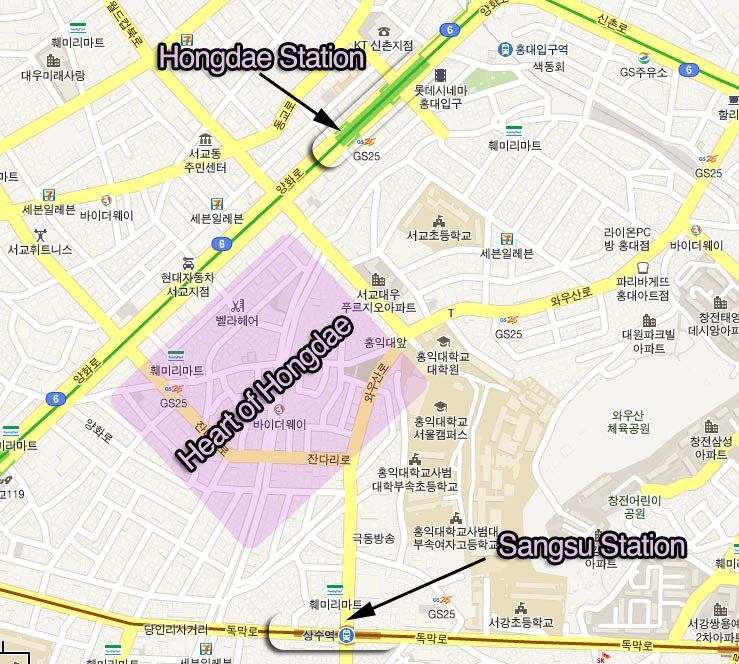 Are Hongdae University Station and Hongik University station the same one? 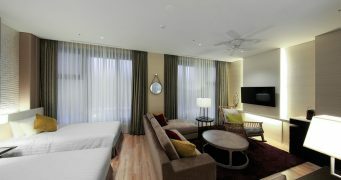 To receive updated news and information, click above to Subcribe to this Examiner or follow on TWITTER @beautyasdesign. companies that offer you with the required type of services. just wanna ask… is it true that price for clothes especially is much better at hondae than at myeondong? and lastly 😉 is there street music other than on saturday & sunday? lots of thanks for this info. 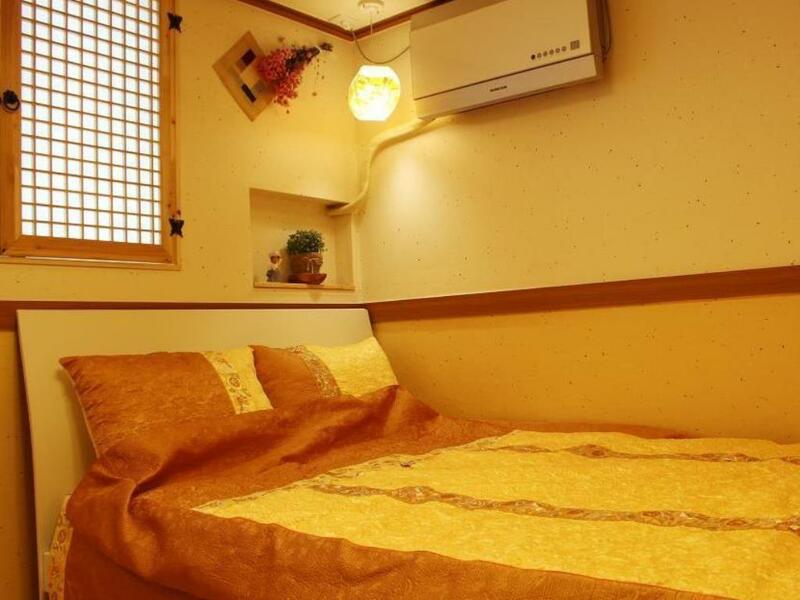 the Jonggak Station sounds tempting and will try this one in my upcoming trip. Great stuff mate. I stumbled upon this site while I was in Korea looking for things to do, and it really helped me. I think it would be really cool to do an article on the 25 different districts and their characteristics. How does that sound? Thanks for the great info! Thanks for guiding,,, I will be there soon. Hi Keith, do you know which Myeong-dong station exit number I should take to have the shortest walk to the station turnstiles (I.e. Shortest walk to get to the trains) ? Many thanks!